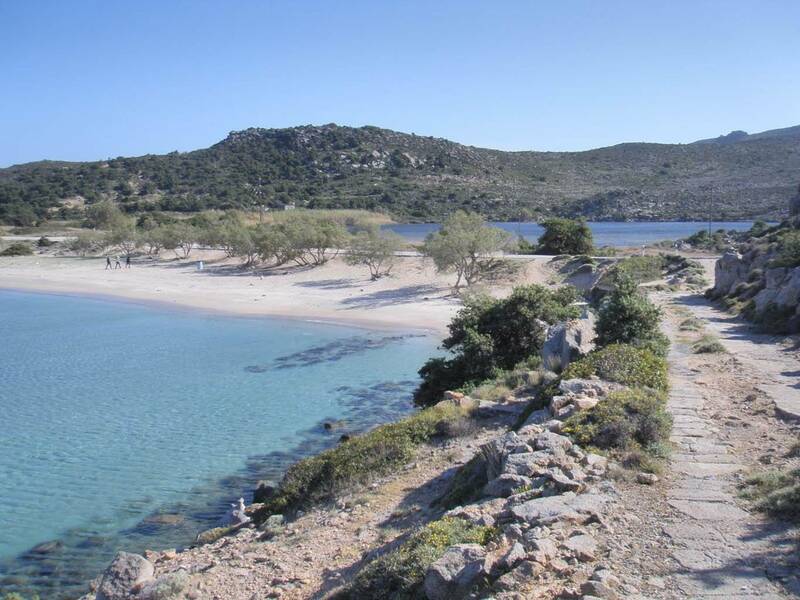 With the island’s port Adamas as the starting point you drive eastwards along the coastal road. 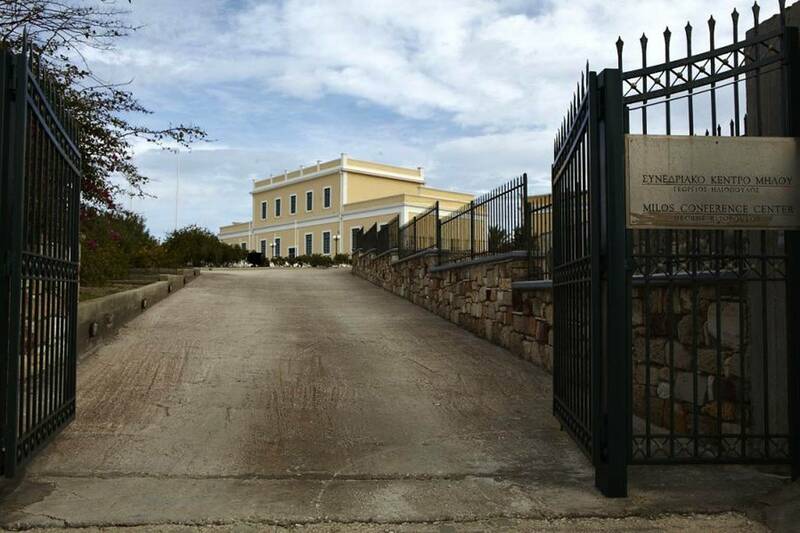 After approximately 500 m you will reach the Milos Mining Museum (P1), created in 1998. 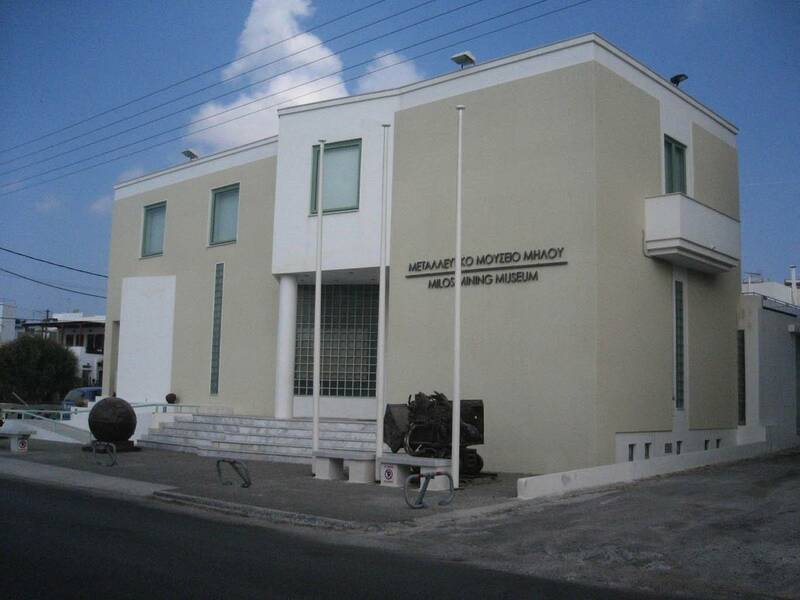 The museum operates with the support of S&B Industrial Minerals S.A. showcasing the island’s rich and unique geological and mining history. Black sands, consisting of magnetite and created by the erosion of volcanic rocks containing metals, can be found in the sea and on the small beach in front of the Mining Museum. The picturesque beach of Papikinos, which stretches all the way to Alyki, starts immediately after the Milos Mining Museum. 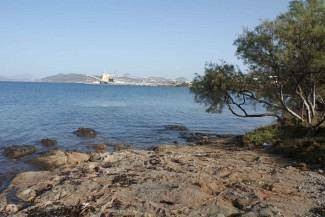 It is one of the longest beaches of Milos, with shallow waters, a sandy shore and tall tamarisk trees. The “Milos Conference Center– George Eliopoulos” (P2), a restored old kaolin processing plant, is situated to the south, approximately 2 km from Adamas. The building was erected in 1925 and represents a marvelous example of inter-war industrial architecture. The courtyard of the Conference Center hosts an exhibition of old machinery used at the processing plant, such as filter presses, a generator, mine wagons for transporting minerals. 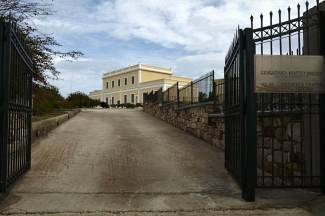 The work of restoring and converting the building into a conference center was funded by ORYMIL S.A., a company belonging to Mrs. Kitty Kyriacopoulos (one of the S&B’s major shareholders), who, in memory of her father George Eliopoulos and for the purpose of contributing to the island’s cultural and touristic development, utilised the abandoned complex of buildings and converted them into an attraction hub for conferees from around the world. Immediately past the Conference Center, approx. 500 meters before arriving at the port facilities at Kanava (P3), look out for the formations at the foothills, about 70 meters to the left of the road; a natural geological section displays the transition of volcanic products of pyroclastic nature, formed at a submarine or a subaerial environment. These products, in their majority pumice tuffs, at places are intercalated with layers of white diatomite. The reddish-brown colour is due to iron oxide leaching. A distinguishing feature is the unconformity between white to greyish-coloured subaerial tuffs, and pumiceous ones of submarine deposition. Upon closer inspection, it is possible to distinguish barrows (trace fossils) of marine organisms that lived on the shallow seabed: fossils of fish, leaves, bivalves and angular – rounded pumice fragments. The formations belong to the Plio-Pleistocene period. The tuff beds are more than 100 m wide and, when considered jointly with their angle and depositional/ rock characteristics, they represent the southward expansion of the white layers of the Sarakiniko (a beach on the northern shores), situated 2.5 km from here. On the left, some 300 meters along the coastal road, you will come across tuff undercuts. These are rockcut baths used in roman times, as indicated also by the name Cavo Giulio (Cape Julius) given to the nearby low hill of Faros. Continue for 200 meters in the same direction and you will pass by the port facilities of Kanava (P3). Two out of six mineral loading bridges operating on the island can be found here: the municipal and the S&B loading bridges, situated next to the company’s bentonite silo and processing facilities. 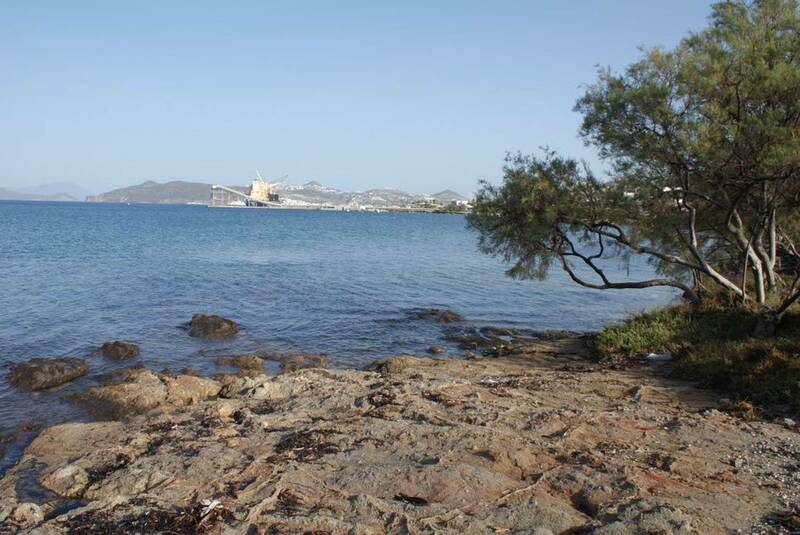 The island’s Autonomous Power Plant (Milos APP – PPC power plant) is located further along, on the beach. Milos APP has a total capacity of 22 MW produced from the combustion of low-sulphur fuel oil. 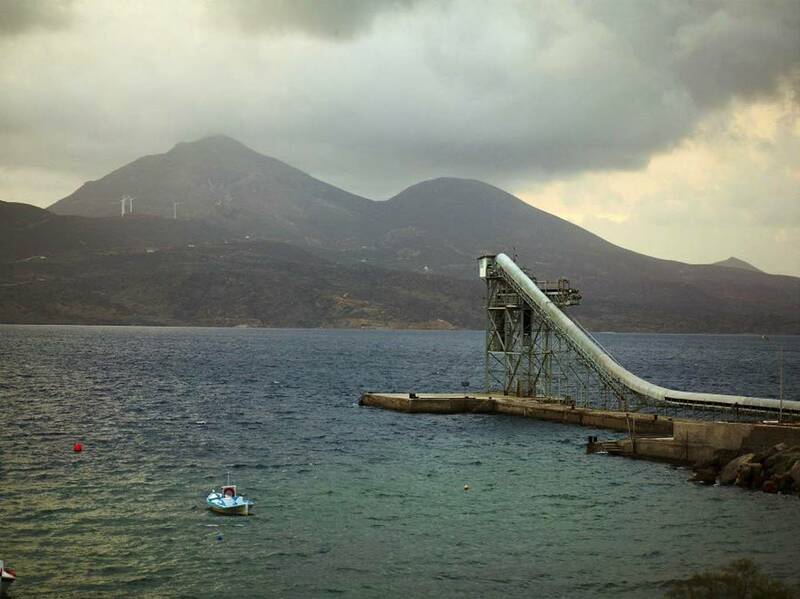 In spite of the island’s remarkable geothermal resources (the largest field in Greece and one of the most important in the Mediterranean), this potential remains unexploited and the island’s electricity supply relies on conventional fuels. On the eastern side of Adamas bay, opposite the PPC power plant, underwater hot springs and gases can be seen along certain sections of the beach (P4), acting as further proof of the island’s active geothermal field. The hot springs with temperatures reaching 50ºC, have a very limited discharge and a high water salinity. Gase and fluid releases on the surface or underwater are due to the tectonic discontinuities, fractures and cracks present in the underlying volcanic rocks. They are identified by the yellowish colour of the rocks, which is caused by the presence of sulphur. 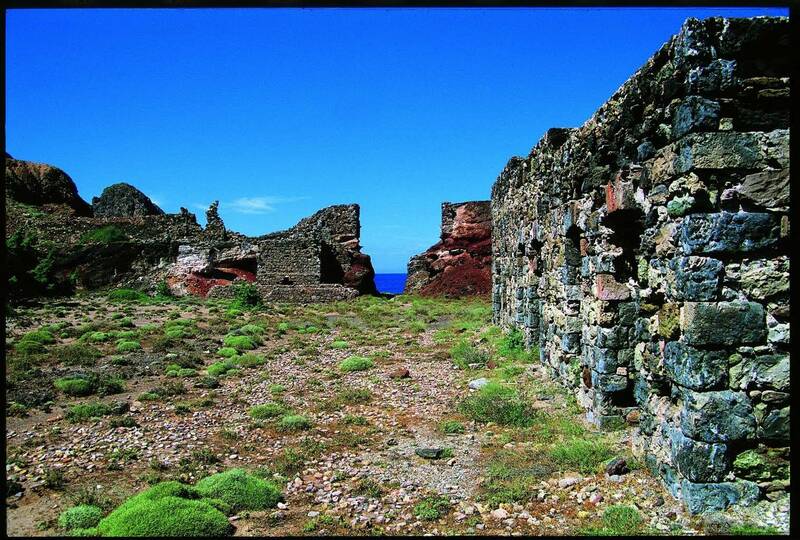 Continue on the coastal road and, right before the island’s airport, you will reach Alyki salt works (P5). These are the old salt production facilities, whereby salt was produced through the natural evaporation of seawater (possibly assisted by the ground’s increased temperature due to geothermic heat). They cover an area of 50 hectares, while their production capacity amounted to 5,000 tonnes of salt/year. The remains of a salt loading bridge can be seen by the sea. The facilities are presently in disuse, with 1981 marking their last year of operation. Alyki are an important wetland, with halophytic vegetation, which means that the plants growing in the area require high salt levels in order to develop. Such species include salicornia (Salicornia europaea), which in summer adopts a characteristic red colour, Sarcocornia perennis and Suaeda vera. Every spring and autumn the wider area acts as a rest stop for many species of migratory waders and raptors. Further along the road, you will notice the presence of vitreous lava rock that is notably fragmented into larger and smaller blocks. This specific type of granular lava is characterized as perlite and, once crushed and heated rapidly to 900οC, it expands to produce a more than 10 times lower bulk density product (for more information consult the industrial mineral Perlite). Touch a piece of lava rock and you will understand how the rock’s characteristic texture gave rise to its local name: it is called zaharopetra [of Halepa], meaning sugar rock, as it looks like agglomerated sugar. 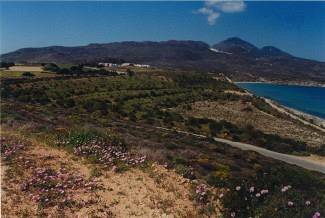 It can be found from Mavra Gremna all the way to the beach of Ahivadolimni. 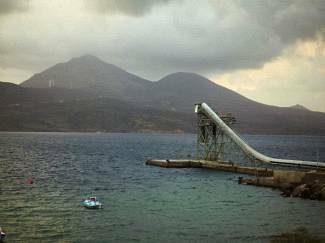 The area before Ahivadolimni (P6), set amphitheatrically above the bay, was used from 1954 to 1982 by S&B as a perlite mine. At present it is a characteristic example of an exhausted mine that has been rehabilitated and fully integrated into the natural landscape and ecosystem. It should be noted that by using local species adapted to the island’s adverse climatic conditions, it was possible to rehabilitate the area of the old mine. 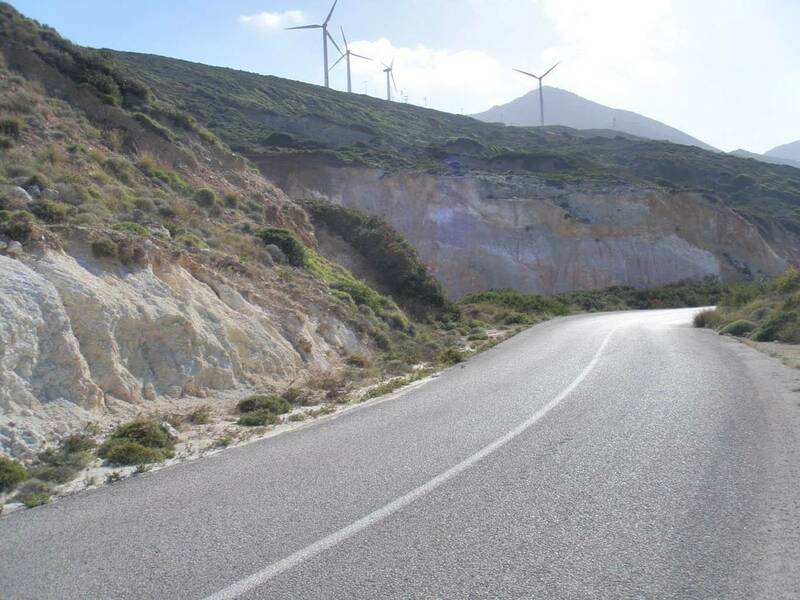 Along the route from Alyki to Ahivadolimni, characteristic plants and trees of Milos, such as cedars and mastic trees, can be seen lining the road. The island’s campsite, the walls of which were constructed with perlite, is located shortly before the junction to Provata. Continuing along route 1, you will arrive at Ahivadolimni or Hivadolimni (P7), an important wetland for birdlife that attracts numerous birds, depending on the season. Ahivadolimni is one of the island’s two permanent wetlands, along with Rivari. It owes its name to the clams (ahivada) that inhabit the lake. 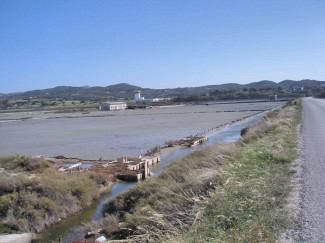 Alyki, Provatas and Agathia are the island’s other seasonal wetlands. Before WW2, the area hosted -among others- eel aquacultures. 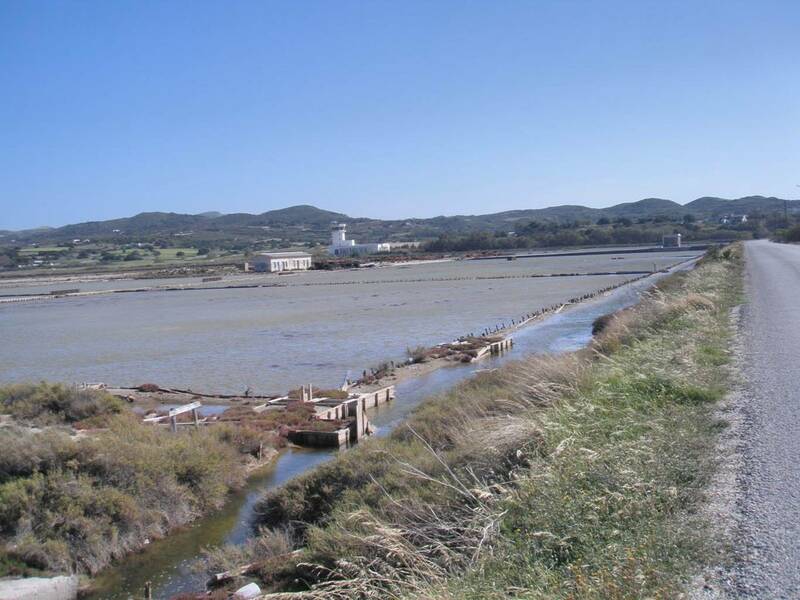 The stone-paved road at the edge of the beach just north of the lake, which is also called Ahivadolimni, leads to some old stone-built warehouses and the abandoned old loading bridge (P8), which was used during the pre-war period for loading kaolin from the mine on the island’s southern part. Rhyolitic – rhyodacitic lava with a perlitic or glass texture is present from Ahivadolimni to Aghia Marina (P9). The formation dates back to the Lower Pleistocene (1.1 – 0.9 million years ago) and is connected to the submarine volcanic cycle and the unit of pyroclastic sequences and lava domes on the island’s northern and eastern parts, along with the unit of lava domes and acid lava flows at the center of the island, at Halepa and Plaka. Raw perlite, which is easily worked by stone masons, was used in the past and continues to be used today as a construction material, shaped into cubes or corner structural elements for the construction of houses, churches, walls, etc. Perlite can also be found at Trahila, in the north, and Fyriplaka, in the south, though the perlite in both these areas is of a younger age (380,000 to 9,000 years, Upper Pleistocene). Immediately after Ahivadolimni, on the way to Agia Marina, you will see the kaolin mine of Halepa, which belongs to the Milos Municipality and is presently undergoing rehabilitation works. S&B has contributed significantly to these works on a voluntary basis. Before reaching site P10, you can see the road leading to it. Diversion: Leaving the main road, turning to the left when ascending the road towards the mine it is possible to view, in the distance to the southeast, the Tsigrado perlite mine and the rehabilitated part of the Kastriani kaolin mine further to the east. The view is panoramic, encompassing all of eastern Milos as well as Kimolos. At site P10, along the road towards Agia Marina, you can spot the industrial mineral kaolin, which is white and in places contains traces of oxidised iron (reddish-yellowish traces). Kaolin (for more information consult the industrial mineral Kaolin) has been mined since antiquity at various locations of the island through the excavation of mining tunnels in order to obtain the deposit’s highest quality (selective mining) and through limited extraction of a few tonnes per year for use in pottery. 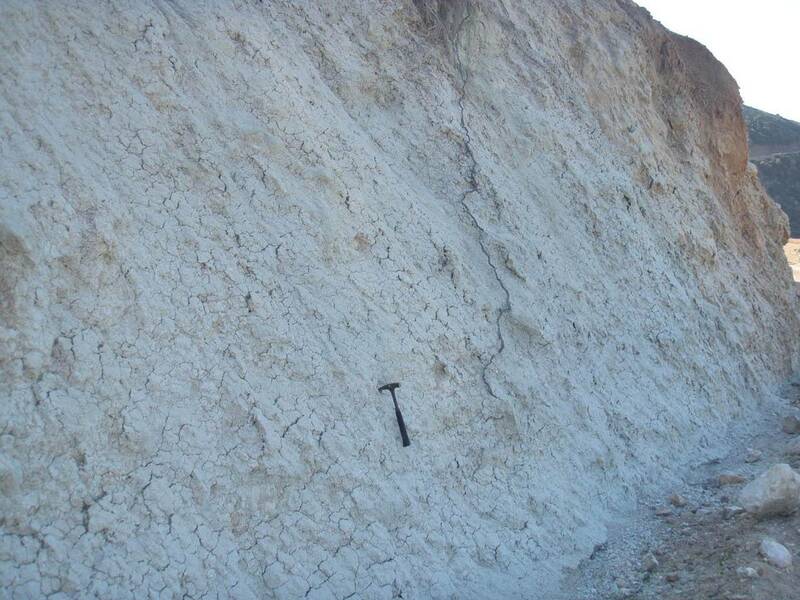 More recently, kaolin was mined through open pits, mainly for the production of white cement. 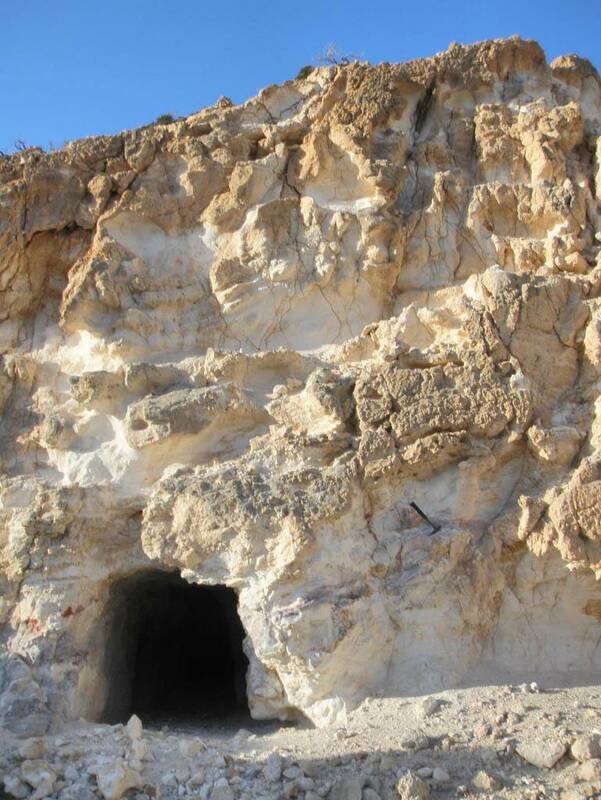 The kaolin of Milos is the result of hydrothermal activity (from fluids rich in sulphur and in iron and therefore unsuitable without beneficiation for the production of porcelain and paper). 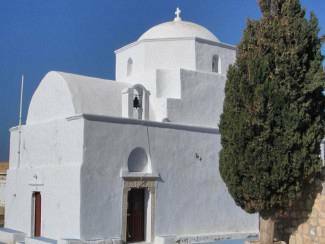 Before arriving at the church of Aghia Marina, right above site P10, at the top of the hill, you can see the little country church of Agios Georgios (Kapoulis), an old historical monastery, and view the wind farm with its four wind turbines. The abundant vegetation on the hillsides represents a characteristic evergreen broadleaf tuft, dominated by mastic trees (Pistacia lentiscus), carob trees (Ceratonia siliqua), Kermes oak (Quercus coccifera), strawberry trees (Arbutus unedo) and broad-leaved mock pivets (Phillyrea latifolia). The vegetation here has been shaped by the salt-bearing northern winds that are common in the area. 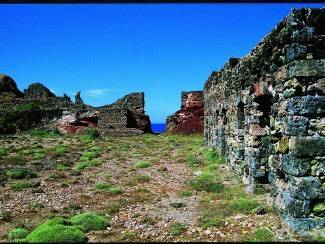 The church of Agia Marina (P11) and the surrounding facilities have been built with local volcanic rock, lava and tuff. The reused marble lintel, bearing the date 1616, is impressive. 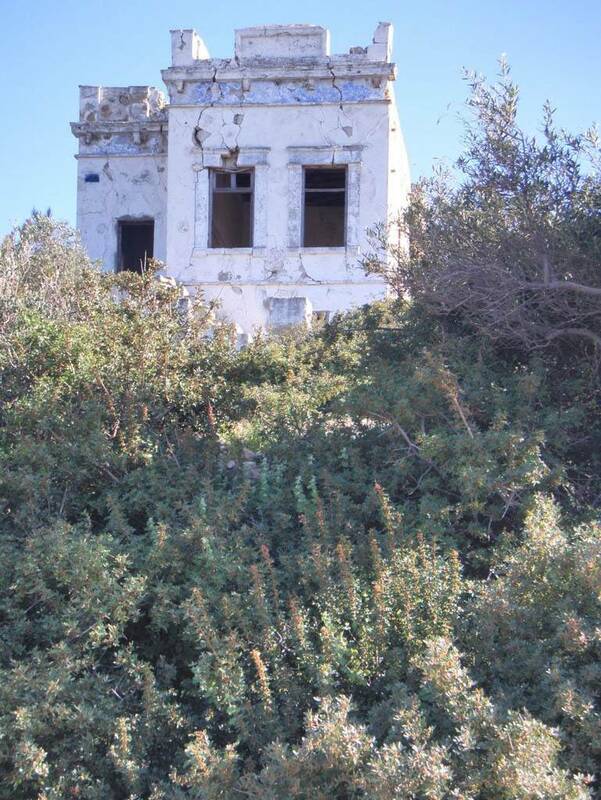 Directly opposite the access road to Agia Marina there exists an abandoned old mansion (P12), the cracks of which lay testimony to destruction caused by seismic activity. The route from Agia Marina to Xerokambos represents a continuous succession of tuffs and andesites, mainly altered. Both are 2.7 – 1.6 million years old (Upper Pliocene). The complex of lava domes and flows present in the western section of Milos was affected by a submarine to subaerial volcanism, which produced locally pyroclastic materials and volcanic breccias. Tuffs transformed into bentonite can be found at site P13. Take a small piece and soak it to feel its plasticity and soapy texture. It is worth noting that during dry periods it breaks and takes on the appearance of snake skin. Andesitic lava (P14) and volcanic bombs are present throughout this section of the route. At site P15 a volcanic bomb has been transformed into clay. At other sites (P16, P17, P18), the size of the bombs is indicative of the initial stage of volcanic activity and their origin from a nearby volcano. The volcanic activity of this period is linked to many small volcanic centers along the fault zone starting at Kimolos and ending at western Milos, which follows a NNE/SSW direction. 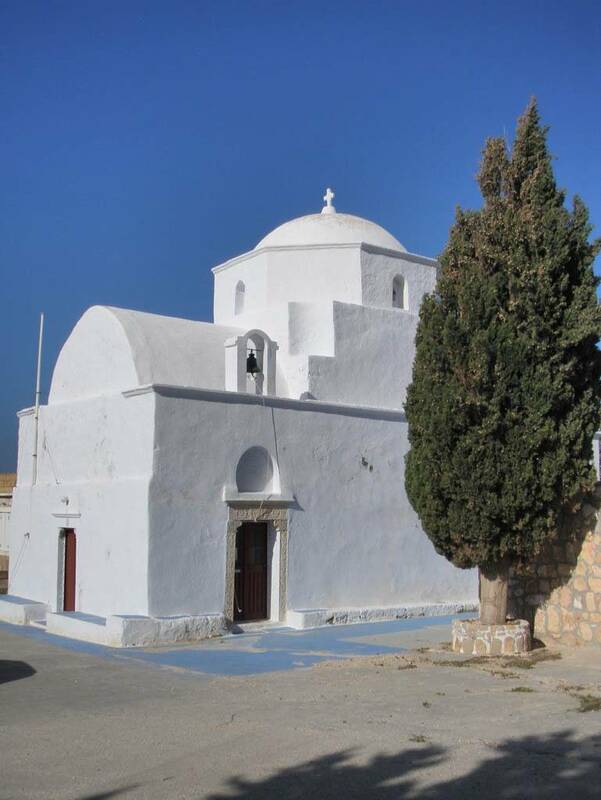 Continuing northwards along a passable dirt road, you will reach a junction leading to Agios Ioannis to the left and to Empourios to the right. Continue straight ahead and in the distance, ahead and to the right, you will see the ruins of an old windmill. 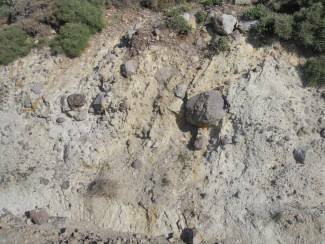 At Xerokambos you will see older volcanic rocks dating to the basic pyroclastic sequence which are 3 – 2.6 million years old (Middle – Upper Pliocene). 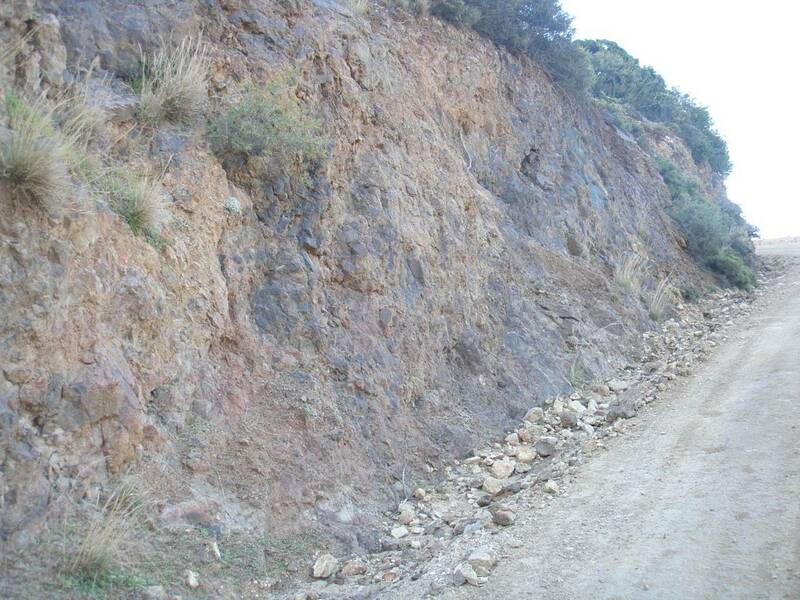 Slightly further down, at Mersinia, there exist old kaolin and barite mining drives (P19). Barite, which owes its name to its high specific gravity, is present in veins cross-cutting the kaolin beds and is either finely granulated and clear or agglomerated into crystal clusters. At site (P20) you may take a rest and decide whether to continue on foot or by car. If you choose to walk, please note that for the next 5 km there are no water sources or shops for supplies. 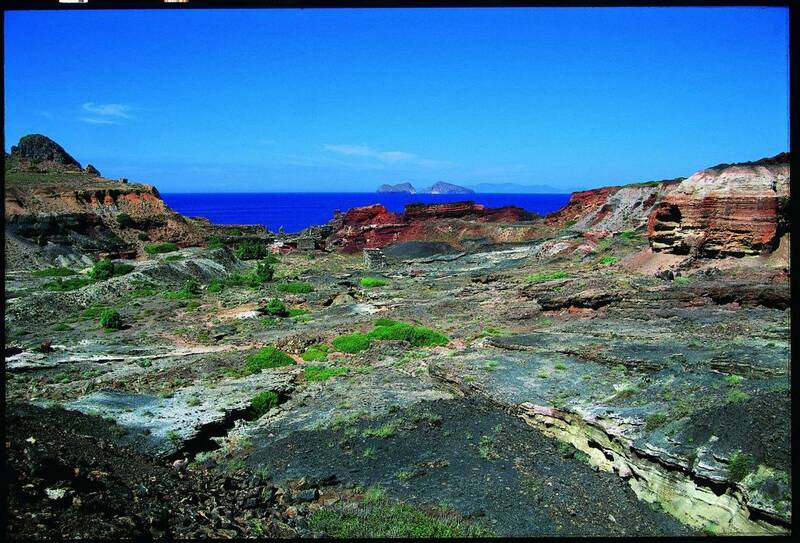 Continuing on route 1 to the north, towards Cape Vani and the old manganese mine, you will encounter hard volcanic rocks, generally of intermediate acid composition (andesitic and dacitic lavas and domes) in a low vegetation environment. Some noches (lava cavities) seen around in this area are attributed to the rock’s erosion caused by the strong salt-bearing winds during winter times. In the distance, to the right, colourful pyroclastics (tuffs) can be seen, owing their colours to iron and sulphur oxides. 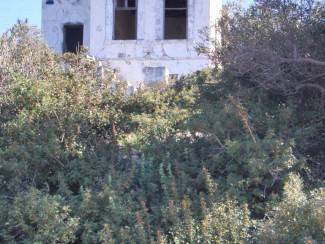 The garigue vegetation of Milos can be seen growing along the road. Abandoned old kaolin mines are also visible. At the junction, turn right (the road to the left leads to the sea) and you will cross through a large area of Phoenicean junipers (Juniperus phoenicea), which are local conifers. The vegetation on Milos is Mediterranean and consists mainly of evergreen broadleaf and brushwood tufts. Formations of Phoenicean junipers mixed with mastic trees (Pistacia lentiscus) and wild olive trees (Olea europaea var. oleaster) grow along this section of the route. 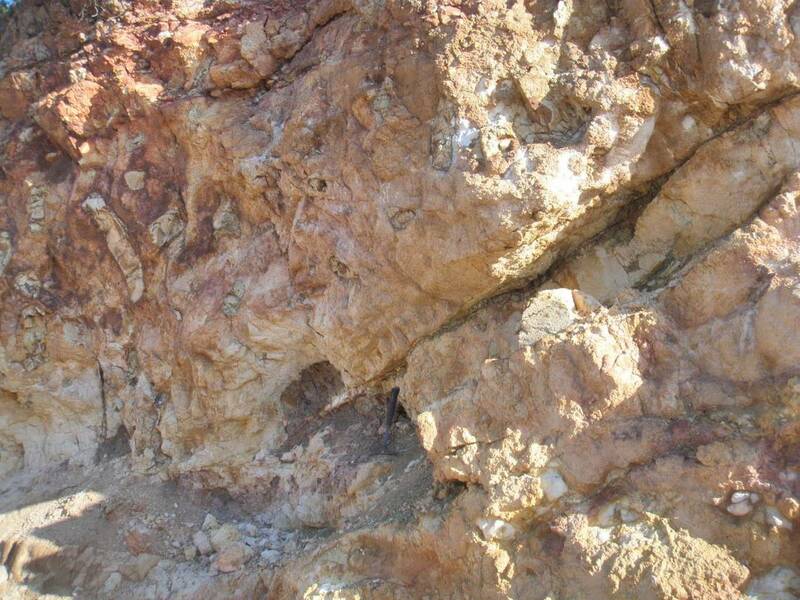 The first indication of metallic mineralization can be found upon exiting the area of Phoenicean junipers, whereby traces of mining activity are discernible some 100 meters to the right, stretching all the way to the Vani mine. The colours of the vegetation are in complete contrast to the impressive deep red colours of the rocks shortly before entering Vani mine. 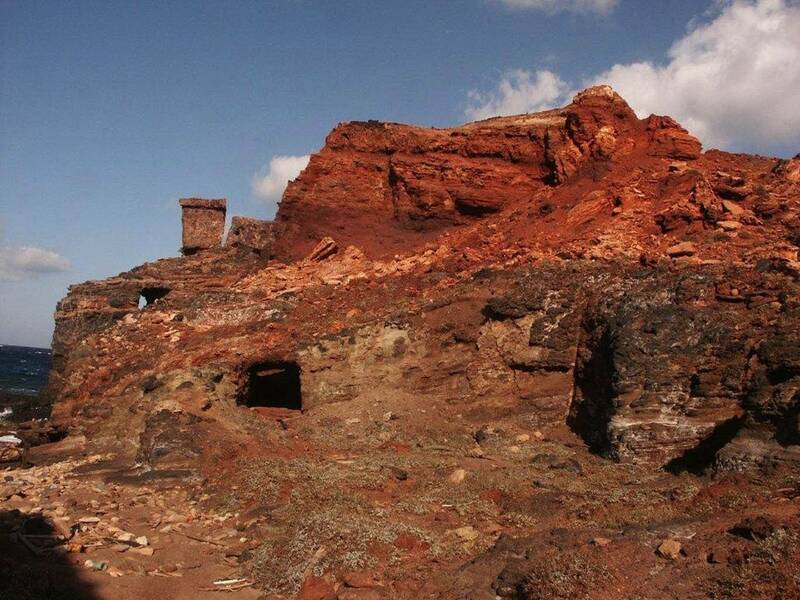 The Cape Vani deposit, on the island’s NW section (P21), which has a low manganese and iron content, was exploited intensively during the periods 1886-1909 and 1916-1928. The business employed 150 miners, of whom approximately 50 were women and children collecting and selecting the pieces of the mineral, and the remaining 100 working on the transportation and loading of the mineral onto the ships. Mining was usually effected through open pits, followed by selection by hand, in order to achieve optimal quality. Manganese mineralisation at Vani (for more information consult the industrial mineral Manganese) has resulted from the hydrothermal deposition that occurred over the last 3.5 to 2 million years (Upper Pliocene). 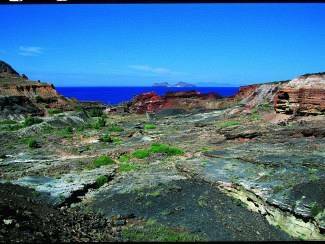 Initially, the original volcanic tuff was deposited onto a shallow marine environment. The formation was then subjected to pressure and transformed into psammitic tuff, the structure of which developed vertical cracks (diaclases). The hydrothermal fluids flowed through these cracks and migrated laterally depositing manganese and other metals’ oxides, thus forming veins and veinlets as well as friable agglomerates of manganese and barite minerals in a sandy matrix . It should be noted that on the ground at Vani there are many traces of the shallow sea that covered the area in the past. Tooth and bone fossils of mammals have been discovered, along with marine fossils of bivalves, corals and other interesting finds. Of the entire mine, only the derelict buildings, structure foundations and the loading bridge at the beach have survived to date (P22). Old tunnels and open-air mining operations are visible at Agathia beach (P23). The old port facilities have also survived. The beach is easy to access and a swim in the sea is highly recommended. From Agathia return to Mersinia. For ardent walkers, an alternative route past Mersinia is to follow the Hunters’ path leading to Empourios (P24). A coffee shop operates during the summer months at Empourios, where it is possible to buy supplies. The perlite silos and loading bridge of S&B at Ambourdechtaki are visible from the road to Empourios. The destination of ships departing from the loading bridge are mainly other Mediterranean ports, as well as Northern Europe, an indication of the island’s continuing mining activity. Empourios, as indicated by the word (Emporeion=Trade Center), was the connecting point with Klima since antiquity and with Adamas, after the Greek War of Independence, through the use of sea vessels (ships, boats, etc.). 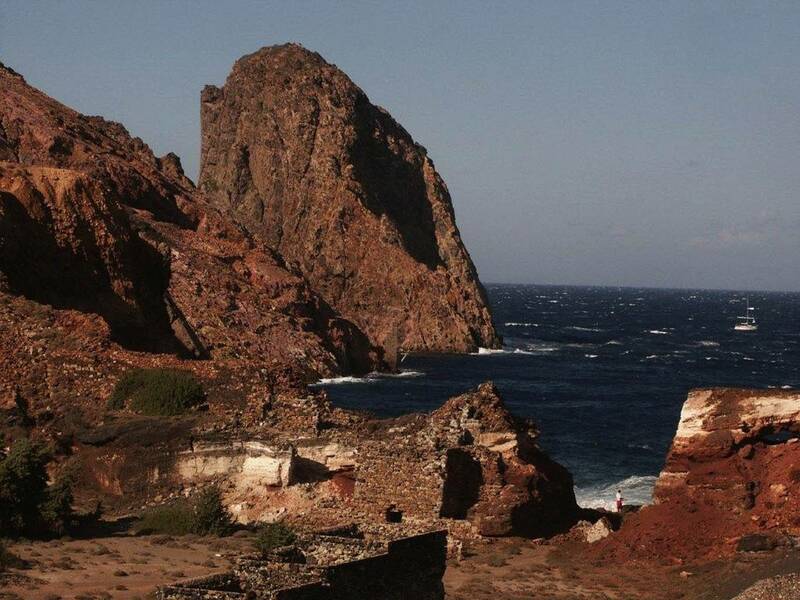 Mine workers, livestock farmers and the few inhabitants of western Milos were transferred across Adamas bay through Empourios. Continuing southwards along the main dirt road, you will encounter the shallow waters of Rivari (P25), along with a pretty beach. It has been formed from the depositions of sand between the rocky outcrop of volcanic tuff (coastal geological formation called “tombolo”). The name Rivari comes from the turkish word “divari” meaning “aquaculture”, which was exploited by the monks of the Agia Marina monastery, located just above Rivari, for their own use or for trading. Rivari is included in the Natura 2000 network for the protection of environmental and natural heritage. Dozens of permanent and migratory bird species nest at Rivari, as well as Ahivadolimni and the island’s other wetlands. Finally, ascending the road towards the Holy Monastery of Agia Marina, you reconnect with the main road and complete route 1.